Note: Data till 22nd from SEBI. 23rd is provisional data from the exchanges. In general, the provisional number is around the same ballpark as the actual data which is released a day later by SEBI. This is the single longest selling streak by FIIs. It’s also taken December to a “sell” month, the first such month in 2014! What to do with this data? Should we run for the hills? No. The first thing you do is to understand why it’s important. 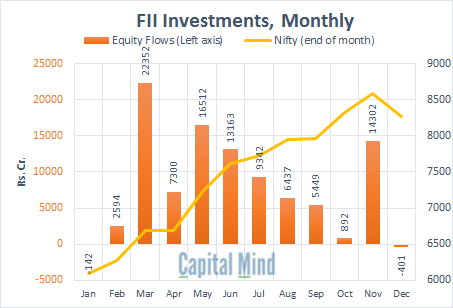 It’s important because FII flows have carried the market for most of the year. See how that cumulative 20 day figure never went below zero? They just kept buying and buying and buying. And now, when they stop buying, or heaven forbid, actually start selling, someone’s gonna have to take that slack. And for the last few days, domestic investors (institutions+retail) have picked up their purchases. But that can vanish very fast, because domestic investors have been absent for the most part this year. 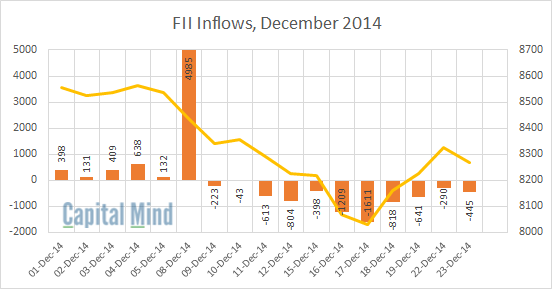 Will FIIs come back in Jan after the “holidays”? There’s no hard and fast rule that they will. 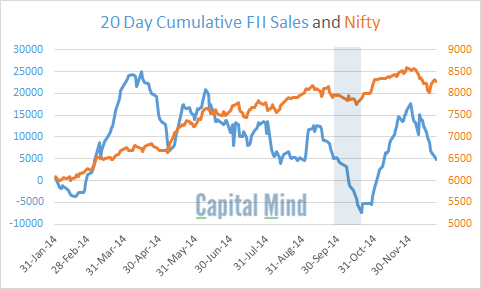 In fact, in 2007, 2008 and 2009, FIIs were net sellers in January (though they have been net buyers in the last five years in January). So there’s no reason to believe they won’t go back into sell mode in Jan.
Be very careful, but we wouldn’t pull out money unless our stop loss points are hit. In fact, we even bought a stock yesterday in the Capital Mind Premium portfolio.